Lifestream BioPsyllium+ is a unique formulation providing Psyllium husks and digestive enzymes that contribute to normal bowel function. Contains the natural digestive enzymes: protease, betaine HCl, ginger root, papain, peppermint leaf, fennel seed and bromelain. This formula is designed specifically for those people who need the additional benefits of natural digestive enzymes. 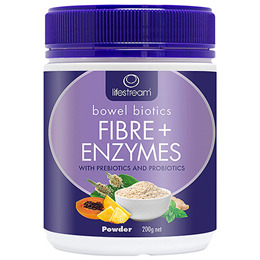 Contains gentle Psyllium husk which contributes to the maintenance of normal bowel health, regularity and function. Providing 4.4g of fibre. Fibre is a Lifestream BioPsyllium+ with Digestive Enzymes is a source of fibre. Fibre is a key part of a varied and balanced diet. Psyllium Husks (64%), Inulin Fibre (30%), Digestive Enzymes (Protease 1.2%, Betaine HCl 0.9%, Ginger Root 0.6%, Papain 0.6%, Peppermint Leaf 0.6%, Fennel Seed 0.6%, Bromelain 0.6%), Bacterial Cultures 1% (Lactobacillus bulgaricus, Lactobacillus plantarum, Bifidobacterium bifidum, Lactobacillus rhamnosus, Lactobacillus acidophilus). Adults: Mix 4 rounded teaspoons (5g) 1-2 times daily, with a glass of water or fruit juice, stir well and consume immediately. Children 4-12 years: Mix half - 1 rounded teaspoon, 1-2 times daily. Always follow the above serving suggestions with a further glass of water or fruit juice. It is recommended that this product is taken not less than 25 minutes before or after food. It is suitable for everyday use and serving size can be adjusted as required. Taking this product without plenty of water could cause choking. If at any time you experience discomfort after taking this product, reduce your serving size. This product may contain traces of soy or milk products. Do not exceed recommended daily dose. Food supplements should not be used as a substitute for a balanced diet and healthy lifestyle. Keep out of reach of children. 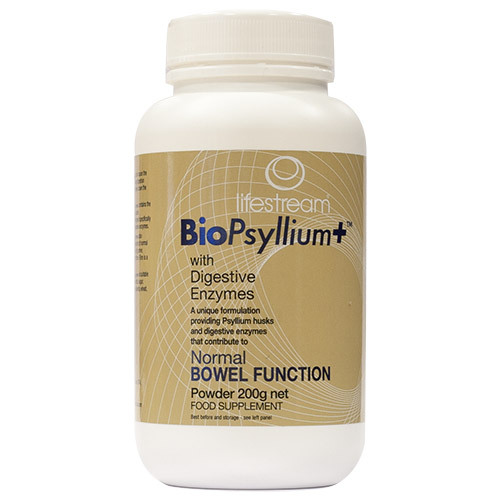 Below are reviews of Lifestream BioPsyllium+ with Digestive Enzymes - 200g by bodykind customers. If you have tried this product we'd love to hear what you think so please leave a review. Lifestream BioPsyllium+ is a unique formulation providing Psyllium husks and digestive enzymes that contribute to normal bowel function.